In September 2018, WiSE Outreach began a WiSE Science Penpal Program with science research students at Our Lady of Mercy Academy of Syosset. We paired 24 WiSE scientists with the high-school students for the 2018-2019 school year. The goal of this penpal program has been to provide these young women with the opportunity to connect with real-life scientists at CSHL and to answer their questions about daily life in the sciences. It is important to expose them to the diverse paths and careers in science. In sharing our love of science with these young women, we hope to provide them with resources, guidance, and inspiration. After the 3rd letters were dropped off, we checked in with some of the scientists to hear about their experience thus far. Many expressed excitement in receiving their letters as a break from normal routine. Our scientists are now waiting to receive their next letters. This program has been fun and exciting for everyone involved. 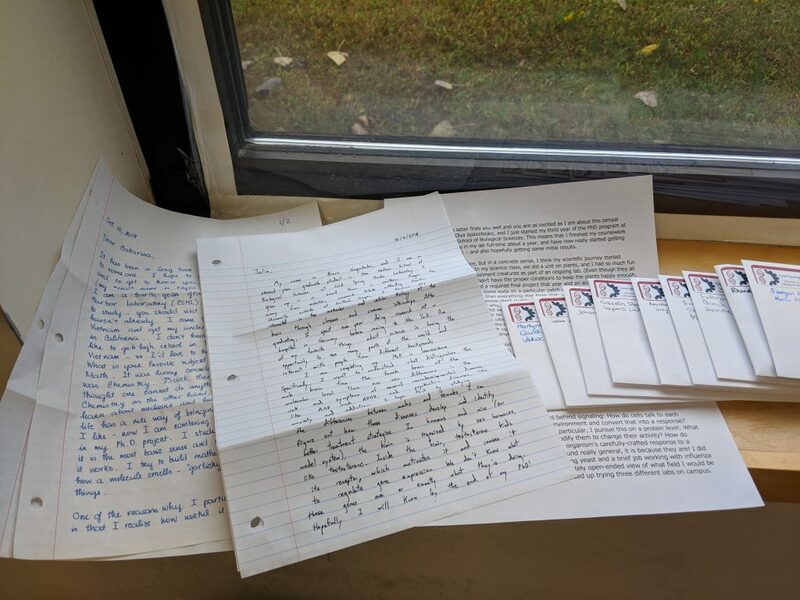 The value of this sort of guidance and mentorship is undeniable and we hope to continue and expand our penpal program for the next school year. Hopefully we have successfully humanized scientists and have inspired these young scientists to pursue their scientific interests.